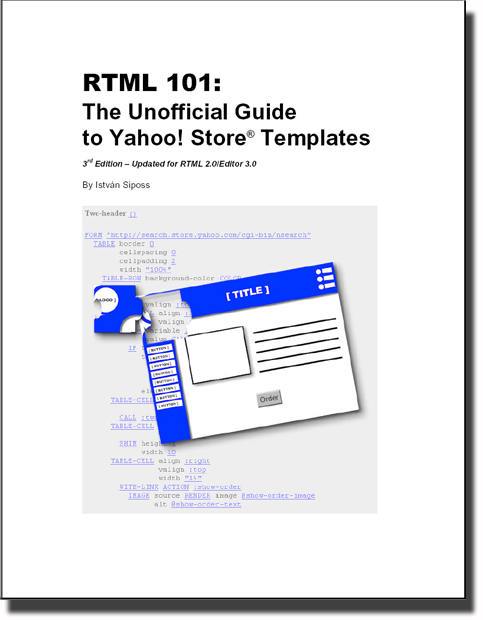 RTML 101: The Unofficial Guide To Yahoo Store Templates. RTML ebook. Compare this e-book with the others in the store. This is the RTML ebook most Yahoo! Store Designers and Merchants use to learn Yahoo's template language, RTML. RTML 101 is the first and only book covering all aspects of working with and creating custom Yahoo! Store templates. It includes a complete RTML reference with explanations and examples. Ever wanted to get away from the basic Yahoo! Store "template look" and make your store stand out from all the other stores on the Internet? Ever wanted to add features to your store only to find out that it was impossible using the standard design interface? By using custom templates, the possibilities are endless! With Merchant Solutions and Store Tags, you can create store-enabled pages using conventional web design tools such as DreamWeaver or FrontPage. However, you must create every single item and section page manually. This is fine if your store has only a handful of products and you are comfortable with building web pages. However, if your store has hundreds or thousands of items, building and maintaining a pure HTML-based store is not efficient. With RTML, you can create one or more templates and all the pages will be automatically created for you whether you have 100, 1000, or 10,000 items in your store. Whatever is possible in HTML can also be done in RTML. Just look at these web sites (all built using custom templates): http://www.artbeads.com, www.sportsunlimited.com, or www.simplybabyfurniture.com. And if that's not enough, all the sites featured on Merchant Solutions' "Success Stories" pages were built using RTML and custom templates! Yahoo! Merchant Solutions users who want to build scalable storefronts themselves. WE ENCOURAGE YOU to look at the table of contents and the introductory chapter (both included here) to help you judge whether this book is for you. Learning RTML is not effortless. RTML 101: The Unofficial Guide to Yahoo! 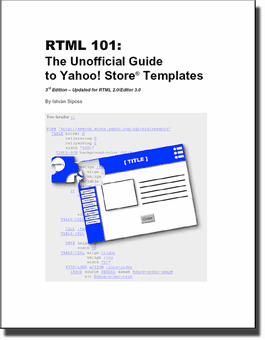 Store Templates is the first complete guide that demystifies Yahoo! Store templates, RTML, and custom types enabling you to take your store to the next level and create unique and professional e-commerce web site. Important: The book does not include step by step instructions on how to turn the basic looking store into the more complex looking one pictured in the animated ad on the home page, nor do we make the assumption that your store looks like the basic store pictured in the same ad. However, by learning RTML, you could turn a basic store into a complex, more appealing one. For a step-by-step tutorial-type book on how this web site (www.ytimes.info) was built, look at Deconstructing Y-Times. Since I have a Yahoo Store in development, I was very glad to find this book, RTML 101. Eventually, I hope to be able to learn enough to customize my store. Thank you, Istvan, for sharing your knowledge. There's practically no info online on how Yahoo's custom RTML language, with the great exception of this YTimes ebook. It's a great introduction and gave me a much better understanding of how to dig in. A useful overview of RTML, creating and modifying templates. Already have a custom template but it was enough to encourage you jump in and create new items, edit, delete, and move them around. This book has proved to be an indispensable tool for me when working for my Yahoo Store customers. There is very limited information out there about RTML, and most of what I learned before I purchased this book came from learning things the hard way by just experimenting around with the template editor. It's nice to have at least an unofficial guide to RTML. It could use a few updates, however, as there are several new RTML functions not listed in the book. Thanks, Istvan! This book paid for itself within 3 days, when I had to create a raw-html page in the store editor. And I've only read the first 20 pages!